Thursdays at 5:30pm ET (Can/US), 10:30pm (UK/Ire) and on Friday morning at 7:30am (Australia). Check out Blues and Roots Radio (www.bluesandrootsradio.com) to keep up on all the great music from the world's greatest independent artists in folk, country, blues, Celtic, singer-songwriter, and storytelling. The Teller and the Tale is a half-hour radio programme broadcast three times a week on Blues and Roots Radio, an internet radio station based in Port Credit, Ontario in Canada. To listen simply go to www.bluesandrootsradio.com and click on the "Listen Live" button. Each week I introduce a storyteller from Scotland or a guest storyteller from around the world. During our conversation, we learn something about our guest's life and work and listen to a story. You'll also learn where you can go to find out more about the storyteller and his or her work. And, on occasion, I also play recorded stories from storytellers old and new. As the show's popularity has increased, I've decided the programme needed its own website. Here you'll find information about upcoming programmes, links to our guests' websites, and information about the world of storytelling. I'll also archive past shows so you can listen again once the show has had a chance to play on the radio. So, welcome to the Teller and the Tale website. I hope you find something of interest here. Please leave your comments, questions and feedback. 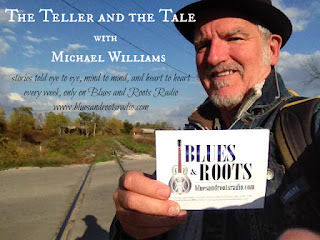 Teller and the Tale on Blues and Roots Radio: Sundays at 7am (EST); Tuesdays at 8pm (EST); and Thursdays at 4pm (EST). Check with Blues and Roots Radio web site for times in your area.